Silvia Pfeiffer, CEO and co-founder of Coviu spoke with Healthcare IT News Asia-Pacific about her team's experience developing technology at the Women in Tech (Asia) conference in Singapore. 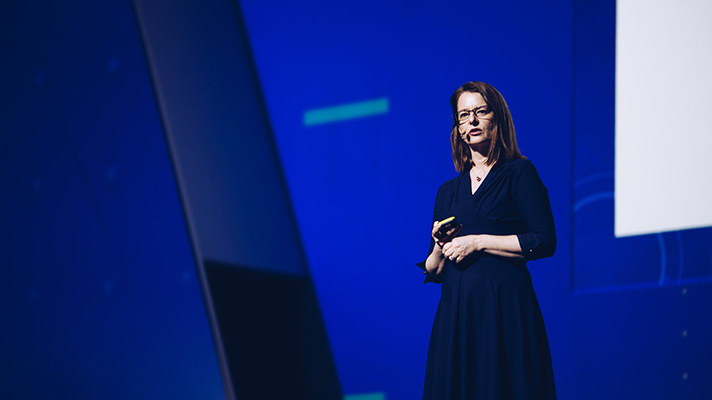 A computer scientist by training, Silvia Pfeiffer, CEO and co-founder of Coviu, a cloud-based teleconferencing software vendor, spoke at the Women in Tech (Asia) conference held in Singapore on Sept. 19. At the sidelines of the event, she spoke with Healthcare IT News Asia-Pacific about how Coviu was conceived, what innovation means to her and a glimpse of what the company will be working on in the near future. How did the idea to form Coviu come about in 2015? Coviu is a spinoff from CSIRO of Australia, we worked in their computer science research space. I was part of writing some of the standards of WebRTC, the core technology we’re using for Coviu. In 2013, we did our first project with a team of speech pathologists out of Royal Far West School, which provides healthcare for Australia’s rural areas. The school was delivering services, but with what I now call legacy systems – an old videoconferencing system with poor quality. They could not share content very well and could not really work properly with the children – it was just a nightmare. I built something with the technology, we’ve developed and knocked something out in a couple of weeks. We built an Minimum Viable Product (MVP) and gave it to them to try. Two years later, they still did not want to let go of it. They really enjoyed and loved it so we knew we had something. We wanted to build something from it because healthcare practitioners needed new technologies that would give them the tools for live consultations, to replicate exactly what they are doing face-to-face. That’s what we built Coviu on. We started in 2015, and registered and launched publicly in 2016. In your experience, what do you see as challenges for clinicians to adopt new technologies? It’s interesting. When we first launched our product was really difficult to get because people are in set in their ways. Clinicians are very busy people. Most of the time, they have their practices booked out and don’t need to look for more patients, so why would they pick up new technologies? But times have changed a little bit because of everything that has been happening in healthcare with AI and algorithms that have been proven to actually make better decisions than clinicians in specific areas. The question of adoption is getting the clinicians, patients and the administrators onboard. And that adoption is changing behavior, which is always difficult. But if you can provide opportunities for them (clinicians) to make their lives easier, to reach more patients and to scale their businesses, you’re on a winning streak, and you can do something with them. What does innovation in the context of your work at Coviu mean? We’re innovating by taking healthcare online. Our goal around innovation is now that we have digitalized the conversation between the patient and the clinician, what else can we do once it’s digital? We can capture data of course, around how many consultations are held. We currently do not have any statistics on how many consultations that the doctors do: They’re all on paper, random statistics. Whereas here, with Coviu, we can capture the accurate data. But we can do much more than that now that we’ve got a digital conversation. Now that the images are digital, we can do image analysis. Part of which is AI, and we do real-time health analysis that can help the clinicians make more informed decisions. For instance, we’re working on a project called Range of Motion analysis, so how well can you move your limbs, which could be interesting after knee surgery or any breakages etc. So, it’s good for physiotherapy. Coviu has been around for about 3 years now. What are some opportunities or expansion plans that you see for the company in the coming years? We have a big roadmap and a lot of ideas we want to bring into the telehealth consultation space. One focus area for us is clinician tools. Let’s say you are a mental health practitioner, psychiatrist or psychologist. Often questionnaires or specific tools are used to help identify whether a patient has a certain mental illness or not, and whether they are progressing or improving. So these are clinician tools that they want to use in their consultations, and there may be tools that patients can take home as a mobile application. But there is also a need for the clinician to see a summary of results from the patient so that they can track the progress of the patient. I see Coviu as a vital part in the future of healthcare where we have mobile applications that patients use for themselves for self-monitoring and dashboards for clinicians to supervise what is happening with the patient. There is also the communication component between the patient and clinician. Another aspect is to support the workflows (of clinicians), which is all around how the business operates. Currently, we are actively selling in Australia, but we also want to enter the Asian market. The Regulatory Sandbox by the Ministry of Health Singapore is a great opportunity for us to do that.